It’s been a busy and eventful year for the KNOM mission. As it comes to a close, we thank you for keeping our work alive and healthy. Across 100,000 square miles of road-less western Alaska, our signal is a popular companion. Our programming is designed to inspire and inform, and promote healing from the difficult social problems which plague many people in this vast region. Thank you for your financial support, and especially for your prayers. May you and those you love enjoy a blessed New Year! LOOKING PRESIDENTIAL (left): KNOM program director Ric Schmidt prepares to speak at an Alaska Broadcasters Association gathering. Ric has been serving as ABA’s vice president/treasurer. In November, he was elected president of the trade association, which represents Alaska’s 109 radio and television stations. Originally from Albany, Oregon, Ric volunteered for KNOM in 1984. A year later, he and fellow volunteer Lynette Schmidt married; today, the couple are raising six children, ages 8 through 16. 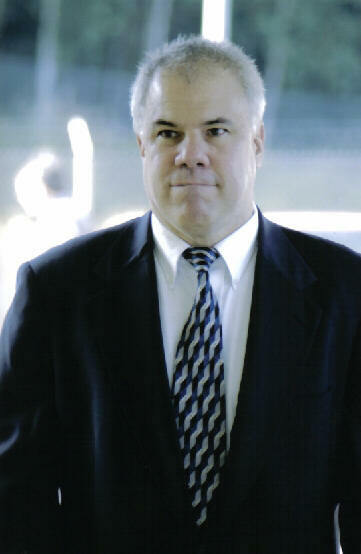 Ric was the founding general manager of Catholic KBVM-FM in Portland, Oregon, and led the station for seven years before returning to KNOM as program director in 1995. He holds a bachelor’s degree in Speech Telecommunications from the University of Oregon. WHITE CHRISTMAS: As this is written, there is little doubt that Nome will enjoy a snowy holiday. In late November and early December, storms were repeatedly lashing western Alaska with sleet, freezing fog and heavy snowfall. The upside? Storms bring warmth. Our temperatures were hovering around freezing, which is twenty degrees above normal � and seventy degrees warmer than Nome’s record lows for early December! INSPIRATIONAL SPOT: Lord, let my actions be prayer in motion: silent, effective and born of love. In the year ending July 31, 2004, KNOM’s operating expenses were $1,024,932.13. Our income was $1,150,656.54. Income: As you can see from the pie chart at left, 97% of our income was from individual contributions. Expenses: “Operating – Non-Staff” expenses include building utilities and maintenance, insurance, network, automobile, tower maintenance and local news expenses. “Fundraising” is the cost of finding new contributors to the mission. We lose about 15% of our contributors each year, about average for a Catholic charity. We have been devoting extra resources to this effort, in order to increase our income to accommodate the cost of operating eleven, and eventually thirteen village translator transmitters which will increase KNOM’s listenership by about 50%. “Technical” expense is mostly electric power for our 25,000 Watt AM transmitter. The work of KNOM is the labor of many kind people, sacrificing together. We thank you sincerely for your contributions to our mission, and pledge that we operate the station prayerfully, and as frugally as possible. If you would like to know more, please write KNOM general manager Tom Busch, who will be happy to send you a full financial report and answer any questions you may have. Once again, thank you for keeping our mission station on the air! LIGHT AS “L.E.D.” The initials stand for “Light Emitting Diode,” the extremely energy-efficient solid-state lamps that are commonly used as tiny red pilot lights in home appliances. In June 2003, KNOM replaced our tower’s side lamps and flashing beacon with L.E.D. assemblies. The L.E.D.’s use 93.2% less power than the old conventional bulbs. Further, unlike bulbs, they do not need to be replaced each year. As a result, since their installation just last year, these little lamps have saved our mission about $9,500! KNOM is the oldest Catholic radio station in the United States � thanks to you. INSPIRATIONAL SPOT: As we all came into this world with nothing, everything that we have is a gift. January 2004: KNOM volunteer Emily Barrett (left) is honored with an international Crystal Communicator Award for her production of educational spots. January 23rd, with general manager/acting engineer Tom Busch out of town, program director Ric Schmidt responds to a small problem at KNOM’s remote transmitter site. He discovers a huge area of frozen blood, obviously from an animal kill, possibly a polar bear, a stark reminder that three miles out of Nome, the station’s transmitter is truly located in wilderness. This month, snow drifts above some Nome rooftops. KNOM is featured in the January edition of St. Anthony Messenger. February 2004: Volunteer Anna Dummer covers the annual traditional dance festival in the Yup’ik Eskimo village of Stebbins. Some students travel 250 miles to take part in the spirited event. In February, KNOM also gives listeners front-row seats to the Bering Straits Elders and Youth Conference, with live gavel-to-gavel coverage for three days. March 2004 sees the first broadcast of a program almost a year in the works, “Elder Voices.” Each half-hour show highlights one Alaska Native senior from the KNOM region. This month, KNOM news director Paul Korchin flies the 1,000-mile Iditarod trail, his 7th time. March 16th, the Federal Communication Commission throws out on a technicality all eleven applications for KNOM village translator transmitters. The translators were intended to bring KNOM’s signal into villages where the station cannot be heard. KNOM plans to appeal. 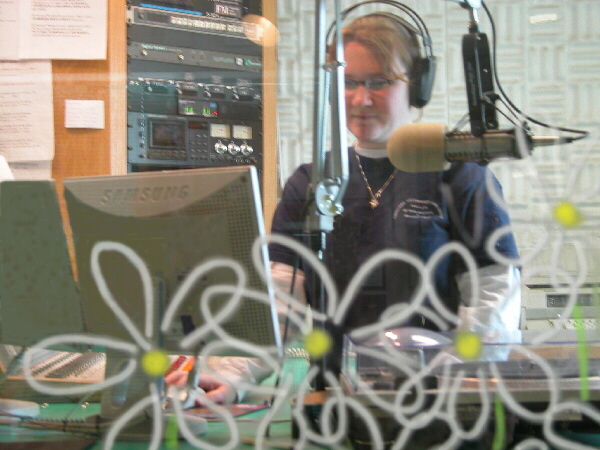 April 2004: Desperate for a spring that won’t arrive for another two-and-a-half months, volunteer Julia Dunlap provides an artistic bouquet to the KNOM Studio A window (left). April 16: KNOM applies to have its translator applications reinstated. This month, volunteer Clinton White observes that while gasoline prices have risen to $2.43 per gallon in Nome, the cost of a gallon of supermarket drinking water is $5.55! May 2004: www.knom.org, KNOM’s web site, celebrates its seventh birthday. 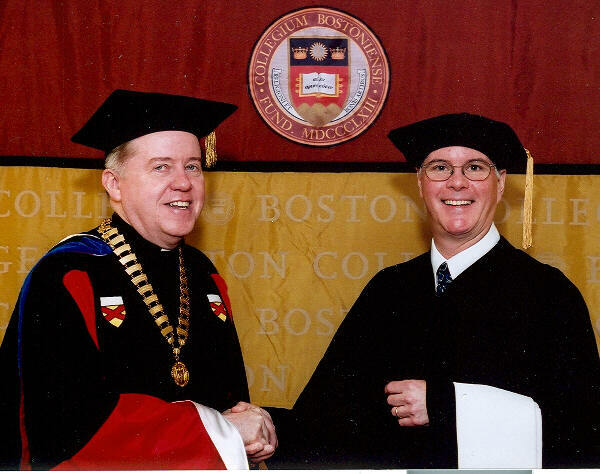 May 22: General manager Tom Busch’s alma mater Boston College presents him an honorary doctorate for his longtime work at the mission (left, with Boston College president Rev. William Leahy, SJ). The event is attended by three dozen former volunteers and KNOM friends. Once more, the mission is in print: KNOM’s volunteers are featured this month in My Friend, the Catholic magazine for children. On Mother’s Day (left), an angry Bering Sea piles hundreds of thousands of tons of broken ocean ice onto a thousand feet of the Nome jetty. 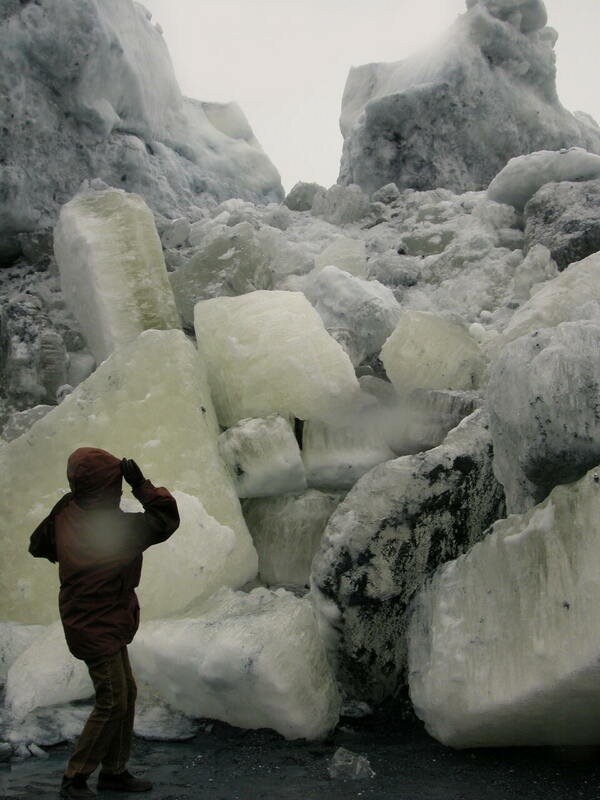 It’s an “ivu” (pronounced EE-voo), an impressive pile of ice thirty feet high, with some chunks the size of pickup trucks. We prayerfully apply all bequests to major improvements and to funds that will provide for KNOM during future emergencies. In June, Tom Busch flies to Anchorage to meet with F.C.C. commissioner Kathleen Abernathy, who is touring Alaska. The commissioner agrees with KNOM that the agency should not impede the station’s remote translator project. The following week, Tom is contacted by F.C.C. personnel, who assure him that the translator applications are in order. July: Beginning her second volunteer year, Anna Dummer tackles the job of archivist, charged with digitally preserving KNOM’s many hours of historic recorded programming. 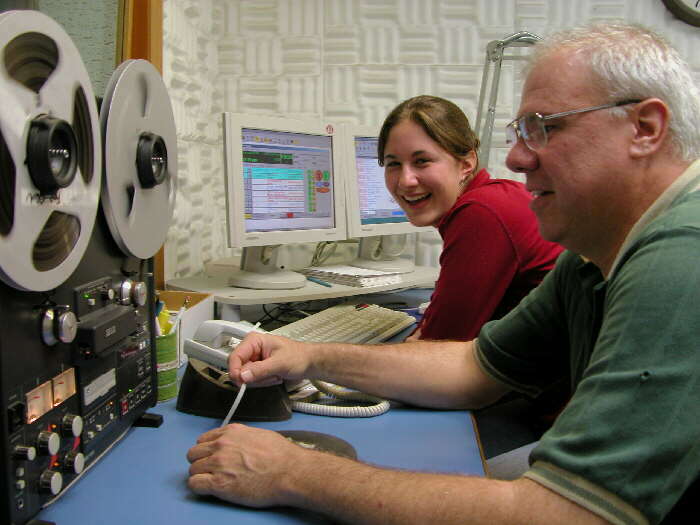 (Left) Program director Ric Schmidt shows Anna how to use a tape recorder, something KNOM staff have not routinely operated for ten years. In July, assistant program director Kelly Brabec demonstrates how to play a vinyl record, something many in the group of visiting village children have never seen. The kids ask to hear “Hound Dog” by Elvis Presley. September 21: The F.C.C. grants all eleven KNOM applications for village translator stations. In 2003, the Commission had accidentally dropped two other villages from the list, and these will be approved later. Staff hope to install at least a few translators before the worst of winter hits, but it’s not to be. 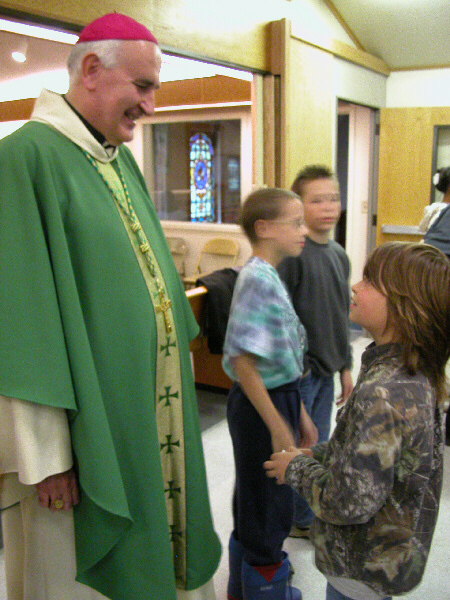 October 10: (Left) Fairbanks Bishop Donald Kettler visits Nome to preside at a Mass of forgiveness and reconciliation, broadcast by KNOM. He apologizes to anyone who may have been hurt by a minister of the church, and asks victims to come forward for healing. He further asks forgiveness of Native Alaskans for historic acts committed against them by the Church. October 19: A 10-foot Bering Sea storm surge topped with 10-foot breaking waves crashes into Nome. The town loses power. Thanks to its emergency generators, KNOM remains on the air, instructing and calming residents during hours of continuous coverage. The storm passes sooner than forecast, damage is limited to a few dozen buildings and everyone breathes a sigh of relief. 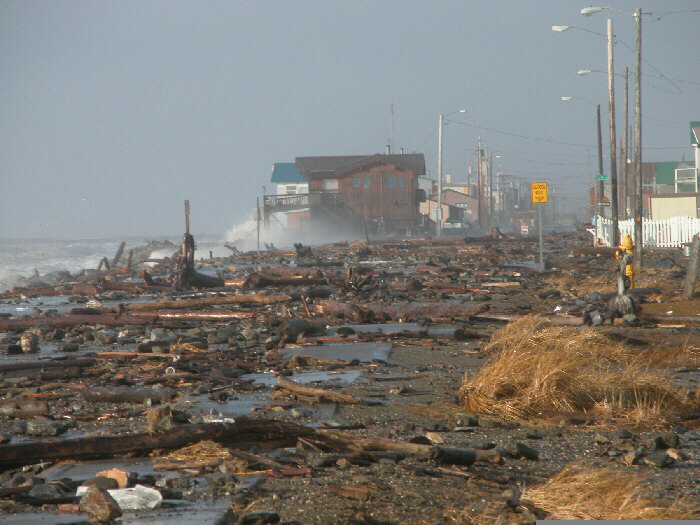 (Left) Nome's main street following the storm. October 22: In Los Angeles, Ric Schmidt accepts KNOM’s Gabriel Radio Station of the Year Award, given for positive programming that addresses human needs. It is the twelfth time that KNOM has received this accolade, one of the highest in broadcasting. 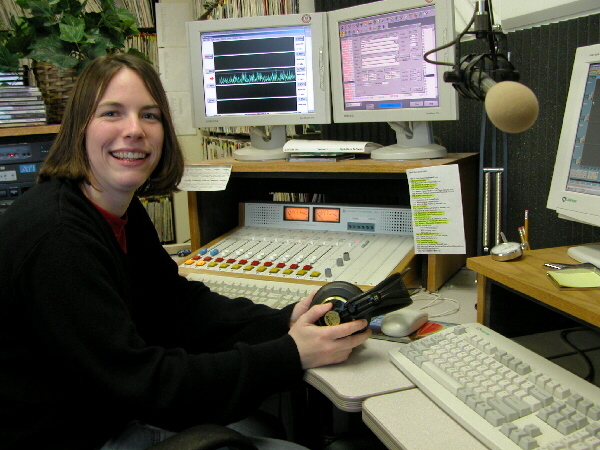 Ric acknowledges KNOM’s staff, as well as the many contributors whose sacrifices keep the station on the air. November 5th, Ric is elected president of the Alaska Broadcasters Association, the state’s radio and television trade organization. At their annual convention, the group awards KNOM “Best Web Page,” and presents two “Goldie” Awards to former volunteer Emily Barrett, one for a Native cultural series, the other for producing the station’s 2003 Christmas play. Emily shares the latter honor with former volunteer Andrew McDonnell, who wrote the program while teaching college in Maine. December: The year ends, as it began, with now former volunteer Emily Barrett receiving awards. We can’t say it too often. You are our mission’s strength. Thank you so very much. You remain in our prayers. May God bless you abundantly throughout the new year and always.